Keeping track of ISAs held with different companies can be both complicated and costly, but we make it easy to bring your savings together. Just tell us where they’re currently held and we take care of the rest. Having ISAs spread across multiple companies can be both time-consuming and costly. Bringing them together means less stress and less paperwork. Our straightforward transfer process makes it easy to bring your investments together — just tell us where they’re currently held and we’ll take care of the rest. It’s free to transfer, and we’ll even cover any exit fees you may incur, up to a total of £500 per person. T&Cs apply. Please be aware that if you transfer share classes that aren’t supported by Fidelity, they’ll be sold and the proceeds will be reinvested in supported share classes, meaning you’ll be out of the market for a short period, and may have to pay additional costs as a result. If your investments are moved to us as cash, you’ll be out of the market while your money is being transferred, so you could miss out on growth and income if the market rises during this time. Receive £20 to £1,000 cashback if you apply to transfer your ISAs, pensions or other investment accounts to us by 7 June 2019. Assets held in an existing Fidelity pension, including the Fidelity Personal Pension provided by Standard Life, the EBS SIPP and any defined contribution pension scheme held through Fidelity are not eligible for the cashback offer. This offer is valid for qualifying applications received between 15 March 2019 to 7 June 2019. Cashback payments will be sent to you after the closure of the Offer (7th June 2019) and up to 90 days after the completion of your last eligible transfer. We may open a Cash Management Account (CMA) on your behalf to enable us to facilitate this payment to you. The CMA is a separate account in your name that helps manage cash, currently for the purpose of paying cashback to you. This cash account will appear on your account summary online. We will endeavour to make cashback payments by BACS transfer directly to your bank/building society account if we already hold your details. If we do not have bank details registered for you for the SIPP, a cheque will be sent to the address registered on your account. (For example if we have bank details registered for an existing ISA but not your SIPP, if you are due a cashback, we will send you a cheque for this - we are not able to send your cashback for your SIPP to the bank account registered on your ISA account.) The time it takes to complete a transfer will depend on your current provider(s). The money will be due to you at the point we issue payment. What are the Fidelity ISA transfer rules? Please note: in addition to funds, we also offer a selection of individual shares that you can now hold on our platform in an ISA. View our list of shares. Over time, we’ll continue to add more shares to our range. Please check our list of shares before starting the transfer process as we may only be able to move across shares that are on this list. If you start the transfer process and have shares we don’t currently offer, we’ll have to sell them and move them across as cash within your ISA. You can then invest that cash into any of the funds or shares in our range. Which individual shares can I transfer to Fidelity? Check our list of shares. Over time, we’ll continue to add more shares to our range. An ISA transfer can usually take up to six weeks to complete but this can vary depending on the handling times of the fund groups or platforms involved in the process. This will also depend on whether they are processed by post or electronically. Can you transfer a cash ISA to stocks and shares ISA? You can transfer the cash within a Cash ISA into a Stocks and Shares ISA where you will get the chance to invest in a wide range of funds, investments trusts and Exhange Traded Funds. Get the latest share prices, market data, news, factsheets and performance charts for all FTSE companies. One login, one online statement, one number to call — and one simple fee. Our typical service fee is 0.35%, but by bringing your investments together you could qualify for our Wealth service, one of the benefits of which is a 0.2% service fee. 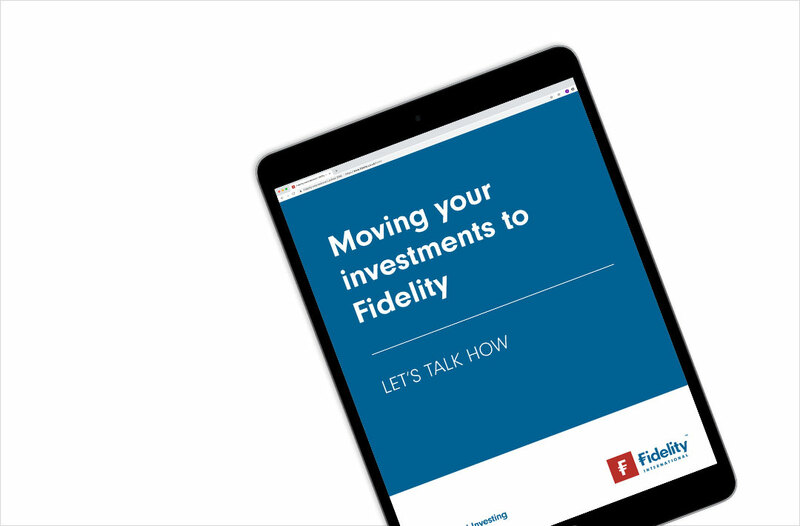 Find out more about moving your investments to Fidelity with our handy guide. Fidelity will reimburse up to £500 of exit fees that you are charged by your current provider if you move investments to us. You can either re-register the investments, which means we take over administration of them without you having to sell them, or transfer them, in which case they are sold and you then buy new investments with the proceeds of the sale. The investments you move must be worth at least, £1,000, or £10,000 if you sell the investments first and then invest with us by debit card. If you are moving investments to a number of providers, not just to Fidelity, we will only reimburse fees relating to investments that are moved to Fidelity. To be eligible to have your exit fees reimbursed when you transfer investments, rather than re-register them, you must invest the sale proceeds with us no more than six months after you pay the exit fee. If you only invest a proportion of the sale proceeds with us, we may choose only to reimburse the same proportion of your exit fees. An exit fee is an administration charge that your current provider levies specifically for dealing with your re-registration or transfer, or for closing your account. It may also be called an account closure fee. We will not reimburse other fees, charges or losses that result from your re-registration or transfer, such as dealing or transaction charges, bid-offer spreads, loss of investment growth, loss of interest, penalties for surrendering investments before their maturity date and Capital Gains Tax liabilities. You should complete an Exit Fee Reimbursement Fee Form. Either download the form here or call us on 0333 300 3351 and we will send you a copy. The return address is shown on the form. You will need to include proof of the exit fees you have been charged. This could be a letter from your current provider or a statement showing the deduction of the fee. We must receive your completed form no more than six months after you paid the exit fees it relates to. You may complete separate forms if you move investments at different times or from different providers. The limit of £500 applies to the total amount you claim, not to each individual claim. Provided that your form is in order and you provide suitable proof that you have paid exit fees, we will make your payment by electronic transfer. If you have not already given us your bank details, you will be able to include them on your form.